I set myself a target last week to transcribe all the interviews from Kota Kinabalu. There were about 15 and it was a total of about 13 hours of recordings. That equated to 26 hours of transcription. Yikes. And, I am still not sure if it is quality data or not. I will find out later. But, I figured I deserved a reward for that first, small milestone. And it just so happened that my helpful Yahoo Weather App was predicting 3 days of clear skies and temperatures nearing 20°C. 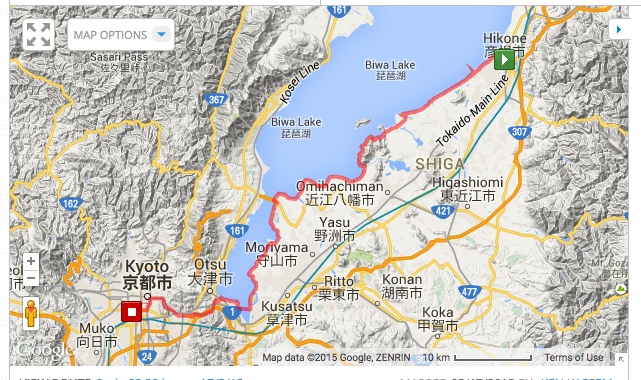 So I planned a cycle trip around Japan’s largest lake – Biwako. Blue – Second day morning. Yellow – Second day ferried in a truck. Green – Second day afternoon. Blank – My sports tracking app won’t export the final day. 😦 I hope I can update it soon. The route for the 3rd and final day of the trip. 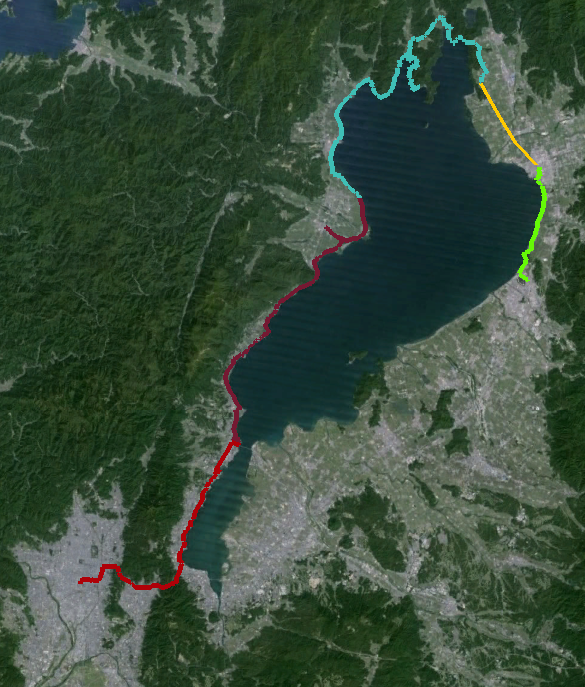 A trip around Biwako can be 210 km, with a few extra added to get from Kyoto to the edge of the lake. In all it was 230 km (185 miles). It would be an easy trip of three 75 km days. What a treat! I also wanted to test my hammock in cooler weather and practice with some camp cooking in cooler weather. This would also be a training ride for longer trips in the future. As a bonus, I wanted to see some of the ducks and waterbirds on Biwako. I spent Saturday in the lab finishing up the last of the KK interviews and tuning up my bike. I worked on the brakes and the chain to make sure all the parts were clean, well oiled and tight. It was fun to get to know the brakes a bit more as I had not really worked on this style of brake before. Sunday morning was cooler and cloudier than I expected. I had a nice small breakfast and set off at about 8:30 am. I had two full panniers with food, clothes, and my hammock. I also had my binoculars and nice new camera. It didn’t take long to get to the lake. This portion was retracing my steps from the end of my Obama trip last summer so it was pretty familiar. Arrival at Biwako and ready to head around the lake. First view of rafts of waterbirds on the lake. The mountains around the northern part of the lake were still capped with snow. I like riding on the small roads that cut through the paddy fields. Especially for the lack of traffic. These paddy fields had lots of interesting birds. I was REALLY hungry by this point. Can you see my bike under the crab? There were some beautiful mergansers at the other end of this little pond. Beautiful little lake side fishing town near Takashima. This Chinese-looking temple had a gate guarded by dragons! By 4 pm I was heading into Takashima. Last year, I had passed this same route on the way back from Obama last year and had spotted some good places for camping. Earlier in the day I cooked some noodles for my lunch and noticed that the stove gas was low and not hot enough to boil the water. This presented some issues for making my dinner. A quick detour to the outskirts of Takashima didn’t result in a new gas canister so I got some supplies from a convenience store for a cold dinner and headed back to the lake to make camp. Perfect set up for my little mobile home. After making camp and having a bite to eat, I climbed into the hammock just after sunset. It was cold before I got in and just got colder as the night progressed. By midnight I had made several forays to my panniers to get more clothes. Eventually I was wearing a knit hat, a knit neck warmer, 3 thermal shirts, a fleece vest, a fleece jacket, 2 pairs of thermal pants, 3 pairs of socks and my sleeping back. But I was lacking an underpad in the hammock and my back was always freezing while my front was too warm. It was a miserable night. When the sun came up, I managed to coax a hot coffee out of my stove and had a cold breakfast. Monday morning started with a thick fog and heavy clouds. I was afraid of rain. When I managed to check my weather app again, it predicted clearing skies by mid-morning so I made the decision to continue with the trip but with the idea of getting a hotel for the second night. Before spending another cold night in the hammock I need to devise a better under-insulation system. My research had me excited about the north end of the lake. It was supposed to be coastal roads skirting steep mountains and it did not disappoint. That road was nearly empty of traffic, full of birds and was blissful. I was even looking forward to the climb at the end which would take me soaring to 400 m above the lake along a parkway to clear the last ridge. In a few weeks this coastal road will be in full bloom with cherry trees. Monday morning with clear skies as I headed to the north end of the lake. Riding along this road with barely any cars was bliss. There was even snow still in the drains! I reached the last town before the anticipated climb at around 10 am. The sun was out and I felt that I deserved a break and a snack before the climb. My pastry was delicious and I didn’t even mind that the vending machine stole my money. Then I looked at the road leading up to the parkway and saw this….. Locked gate. No walking. No biking. No nothing. Closed. So I had to backtrack 7 km to the previous town and cross on the big road and through a big tunnel. I wasn’t thrilled but the coastal road was nice to ride again. Fortunately the inland route had a smooth, wide foot/bike path beside and the climb was not too bad. Even the 850 m tunnel had a small walkway and I walked my bike through the tunnel. That brought me to a another small town before having a choice to stay on the main road or take a smaller coastal road around the hill. I was planning on the smaller coastal road, of course. 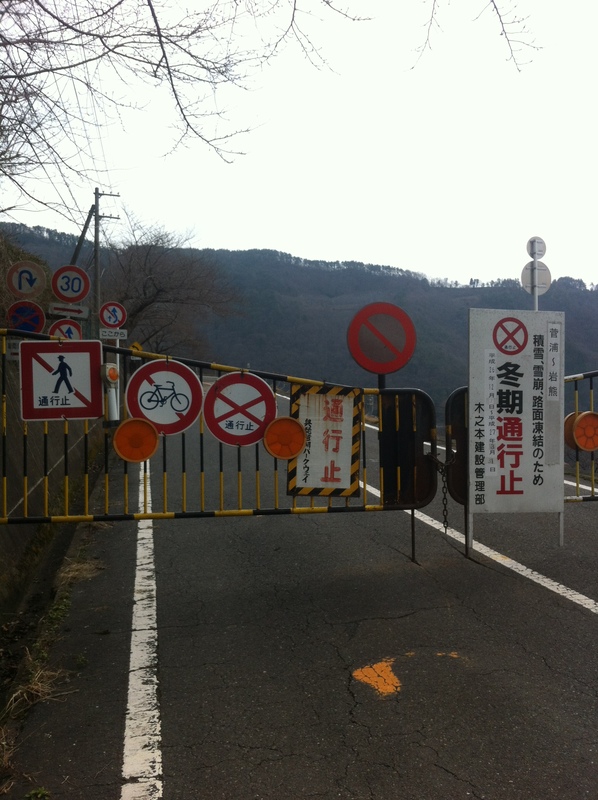 When I finally reached the turn off, it was full of construction equipment and the tunnel was closed. That diverted all the main-road traffic to my idyllic coastal road. How exciting to share a small road with all those big trucks. Not. That ended with yet another small tunnel and then I got to get back onto paddy field roads! Without the cars and big trucks!! I love the paddy field roads. They are usually perfectly straight with long lines of sight and the occasional charming, small town breaking up the monotony. These were no different. Until the paved road turned to gravel. No problem. I just kept going… tracking the main road in the distance as I worked my way back to the lake. At one point I noticed something rather anomalous for Japan…. 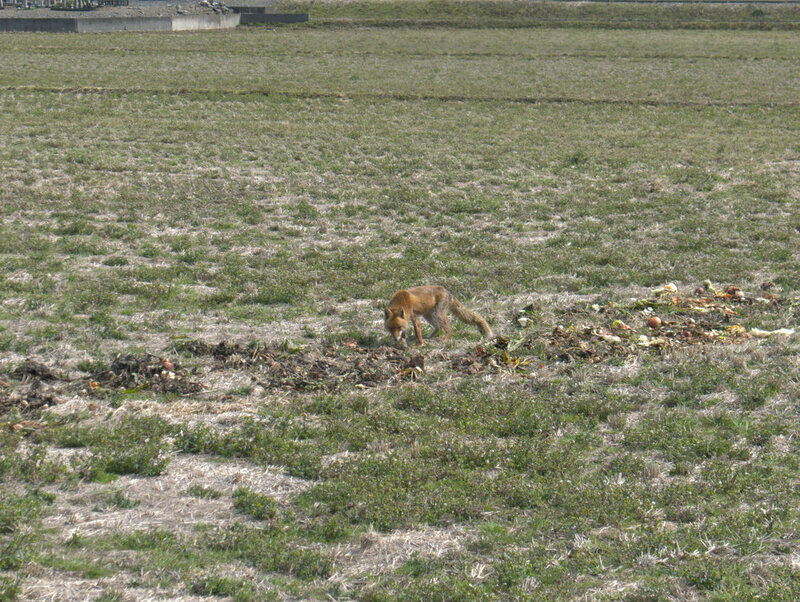 a stray dog in one of the fields. Until I approached closer and it was a fox! And it let me get some photos. I took off my headphones and got closer and closer. So cool! And as I continued on, this time without the music that I had been indulging in (only one headphone. always. for safety sake), I heard that dreaded metallic clicking from the back wheel. Broken spoke. As a farmer walked past with his power tiller I said hello and asked in my best Japanese (which is AWFUL) where the closest bike shop was. He gave me the dreaded X-arms which indicated that there was no bike shop around. I check my maps. The closest town was at least 10 km away. It was going to be a long walk. I passed the farmer in his field and he was with his wife, who had passed me on her bike earlier. 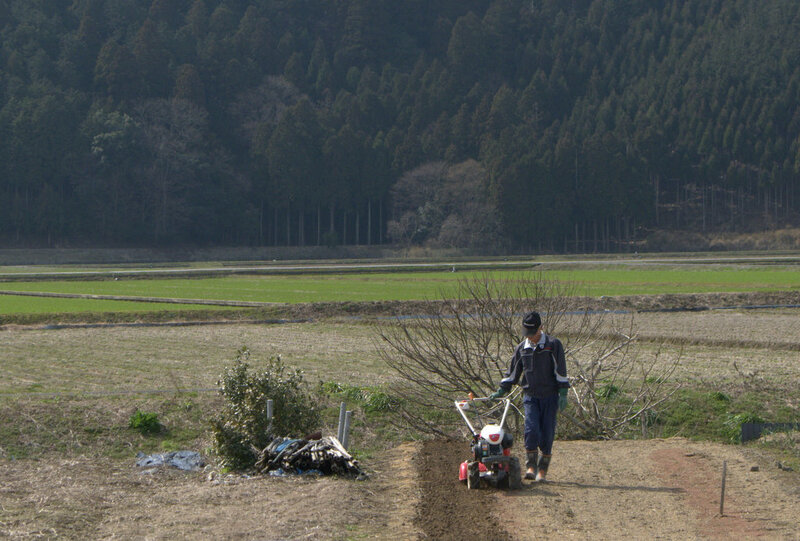 Oto-san preparing to plant potatoes. His wife called out to me in Japanese. I stopped and tried to talk to her. She seemed concerned about what I was doing but kept speaking very fast Japanese. Eventually she held up her hands in steering wheel pose and said “Turukku,” truck. I understood. They were offering to take me to town!!! 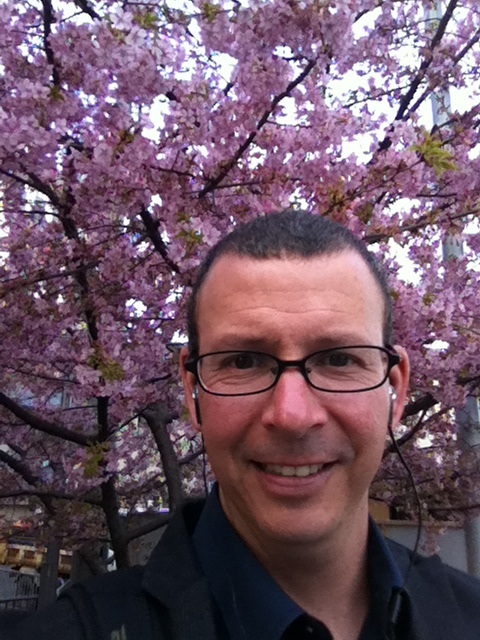 With all the requisite Japanese humility and gratitude I could muster, I gratefully accepted. Oto-san drove me to the closest shop but it specialized in Japanese town bikes and did not have tool needed to pull the cassette. Oto-san was generous enough to take me to another shop about 20 minutes away. We made small chit chat in the car, but with my rudimentary Japanese it wasn’t much. When we reached the new shop, the owner came out and looked at the situation. He was gruff and kept going on about something. Not wanting to keep Oto-san from his potato planting, I just started unloading my things from his truck. 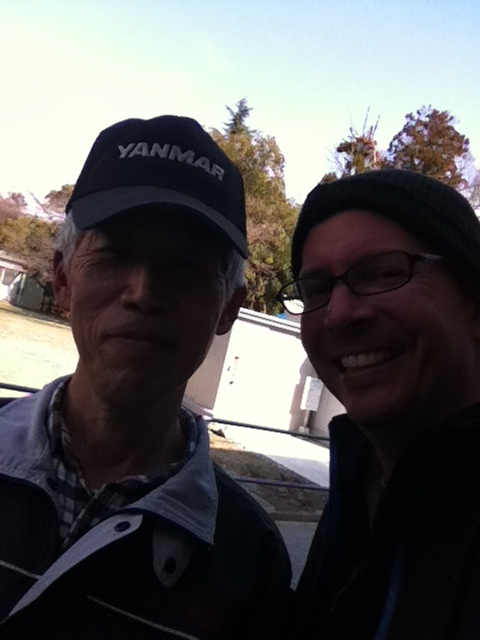 The shop keeper took my bike inside while I said my farewells to Oto-san and got his phone number and address. By the time I got into the shop, the rear wheel was off and the shop keeper was working on getting the cassette off. He had all tools. I got down and started to help and he warmed up. Then his wife brought me a cup of coffee! The new spoke went on without a problem and the shop keeper cleaned my chain, adjusted the brakes and double checked everything! Then he sat down and chatted with me for a while. When I asked how much, he told me (in Japanese, so I’m kind of guessing here) that it was his gift to me. I insisted and he let me give him a token amount. So nice! Mr Hiroshi Nakagawa’s Japan Cycling Federation licence. I wanted to stay and chat some more but I had to make it to Hikone and I was worried about finding a warm place to sleep, so I bade my farewells and headed back onto the road. The rest of the day was spent just focusing on making it to Hikone before dark. I got there just as the sun was setting and found the first reasonable business hotel. After a hot, hot shower I headed down for dinner and found a Big Boy for a big hamburger and endless salad bar – perfect. That led to a warm night’s sleep. On Monday I got up at 6 and was out by 7. I need to get back to Kyoto in time to have a shower and go teach an English class by 5:30 so I wanted to make good time. The day started cloudy and cool but eventually the sun came out and was lovely. I visited the historic Hikone Castle and then stayed by the lake all day. Here are some of the roads I rode along during the trip…. some quite and lined with trees or bordering the lake. Some bike paths along roads. Some tunnels. Some industrial. Quite a mix. Its Japan. I made it back to Kyoto around 2 pm, treated myself to an ice cream, a hot bath and headed off to my English lesson with time to spare and take a few pictures with a spectacular blossoming plum tree. 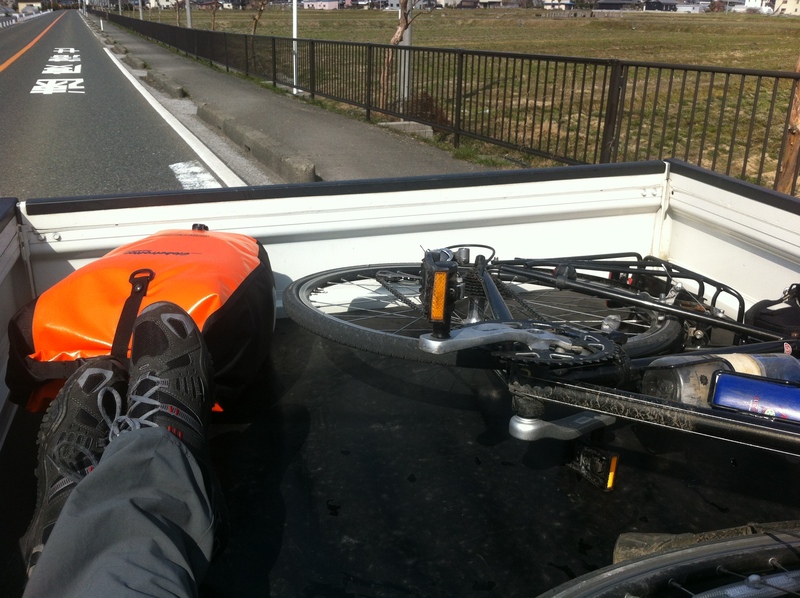 This entry was posted in Cycling, Japan and tagged Biwako, Cycle tour, Japan. Bookmark the permalink. Oh wow. Great ride. 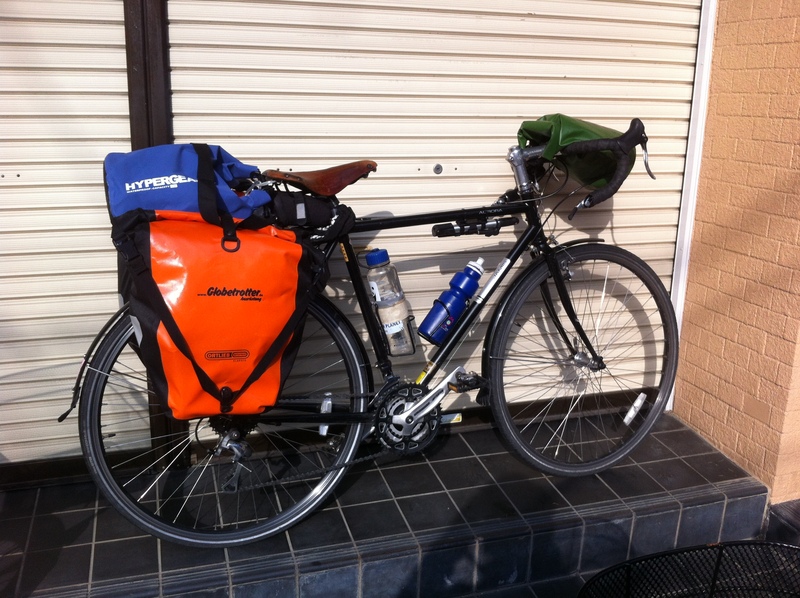 I will be in Japan from 13 April to cycle tour between Osaka and Tokyo. Will look more closely at this route as an option for prt of my adventure. Note that this is a VERY busy season for tourists because of the cherry blossoms and hotels will be full. Plan on camping and using sentos to bathe.